A few months ago I discovered some money in a PayPal account that I'd forgotten about, and decided to spend my 'free' (ie, husband won't miss it) money on some fabric and patterns. I bought a heap of fabric but my favourite by far was Verbena in pink, by Kaffe Fassett. I'm not normally a huge Kaffe Fassett fan but I just fell in love with this fabric. I think because the print reminded me of my favourite flowers - hydrangeas - but also because I just love the use of colour. 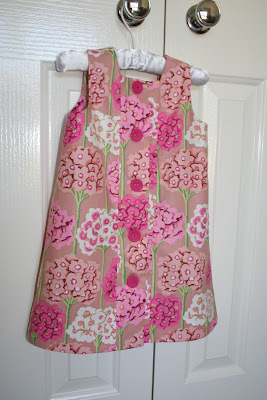 I also bought a few patterns by Oliver + S, including the especially fabulous Birthday Party dress pattern. 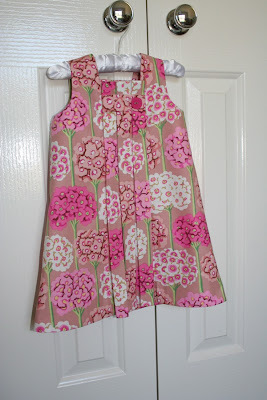 I've wanted to make up the Birthday Party dress in the Verbena fabric for some time now, and with a few special occasions coming up I had the perfect excuse to whip one up for my daughter. I'm pretty happy with the results. The process itself was hassle-free too. The pattern is so easy to follow - it has lots of pictures that help explain each step and I found it easy to follow, even though I am a novice sewer. Even though I love the dress, I think the pattern lends itself more to a less 'busy' print, so next time I make it I will use a less fussy fabric. I can picture the next incarnation of this dress in a simple cornflower blue fabric with ribbons instead of the tabs across the pleats... Now I just need to find the fabric. 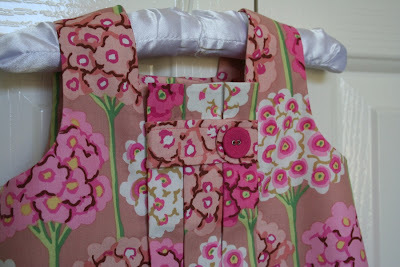 Truly Beautiful and looks Divine on your little girl :) Well Done! Oh my, that is gorgeous and so well made, you should be so very very proud!!! Oh Miss E looks just divine. And a novice??? Since when are you a novice sewer?? Does this mean there is hope for me?